Weyers acrofacial dysostosis (Curry-Hall syndrome) is a rare autosomal dominant skeletal dysplasia manifest by nail dystrophy, oral and dental anomalies, polydactyly of the hands and feet, and mild short stature. We report an 11-year-old boy who presented with onychodystrophy, supernumerary tooth, hypodontia or agenesis of teeth, hyperplastic labial frenulum, polydactyly of the hands and feet, and mild short stature. There was dystrophy of the nail plates of the great toes of both feet. The other nail plates were also affected to a lesser degree, and the toenails are more severely affected than the fingernails. According to her mother, the child's dystrophic nails were present since birth. Examination of his scalp showed normal hair quantity, quality, and structure. There was no history of sweat gland dysfunction. The clinical findings of our patient are consistent with the features of Weyers acrofacial dysostosis. WAD is a very rare skeletal dysplasia. Until date, only a few affected families have been reported worldwide.,,,,, In this article, we describe a case of an 11-year-old boy with features of WAD. An 11-year-old male patient reported to our department with a chief complaint of noneruption of front teeth. The child weighed 45 kg and was 135 cm in height. He was the only child of nonconsanguineous healthy parents with no relevant birth or family history. His developmental milestones were normal, and intelligence was in the normal range. History revealed that he was born with two lower front teeth. Intraoral examination of the patient lower lip were also observed. In addition, the patient had an extra digit on his both hands and left foot since birth [Figure 1]. It was revealed that surgical excision of the supernumerary digit of the right hand was performed in 2010 when the patient was 5 years of age. On general examination, the patient had hypertelorism, broad nose, and incomplete cleft of the upper lip [Figure 2]. The digits showed polydactyly of the left hand and left foot [Figure 3],[Figure 4],[Figure 5],[Figure 6]. There was wide space between the hallux and the other toes on the left foot. In addition, the finger and toenails showed dystrophic changes. Examination of his scalp showed normal hair quantity, quality, and structure. Intraoral examination of the patient revealed the presence of dental anomalies which include both congenitally missing teeth and supernumerary tooth [Figure 4]. The mesiodens was conical in shape. The panoramic radiograph revealed that the maxillary permanent left central and lateral incisors and all four mandibular permanent incisors were found to be missing [Figure 5]. In addition, cleft of the mandibular symphysis and hyperplastic labial frenulum running from the mandibular alveolar ridge to the lower lip were also observed [Figure 6]. The clinical and radiographic features were consistent with a diagnosis of WAD. Oral hygiene instructions were given. In addition, genetic counseling and regular evaluation of the patient by a pediatrician were recommended. WAD is caused by heterozygous mutation in the EVC or the EVC2 gene located on the chromosome 4p16.2. Mutations in the same genes cause Ellis–van Creveld syndrome which shows autosomal recessive inheritance. 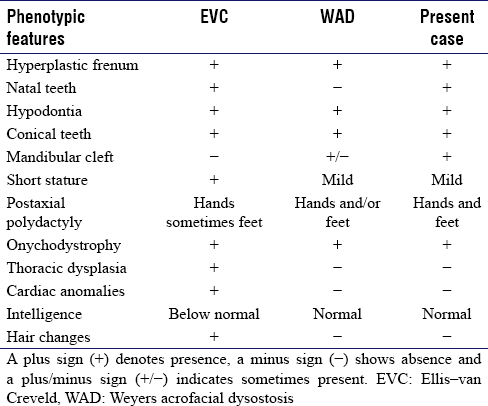 Many phenotypic features of WAD overlap with those of EVC. These features were listed in [Table 1] and compared with the present case. EVC is a more serious type of disorder with additional features of thoracic dysplasia and congenital heart disease. Cardiac malformations occur in nearly 60% of cases of EVC and mostly in the form of atrial septal defect and single atrium., The present case, however, did not show cardiac malformations. In addition, short ribs, thoracic dysplasia, and acromesomelic dwarfism are characteristic features of EVC. These findings were not observed in the present case. On the contrary, our patient showed polydactyly in both hands and left foot. 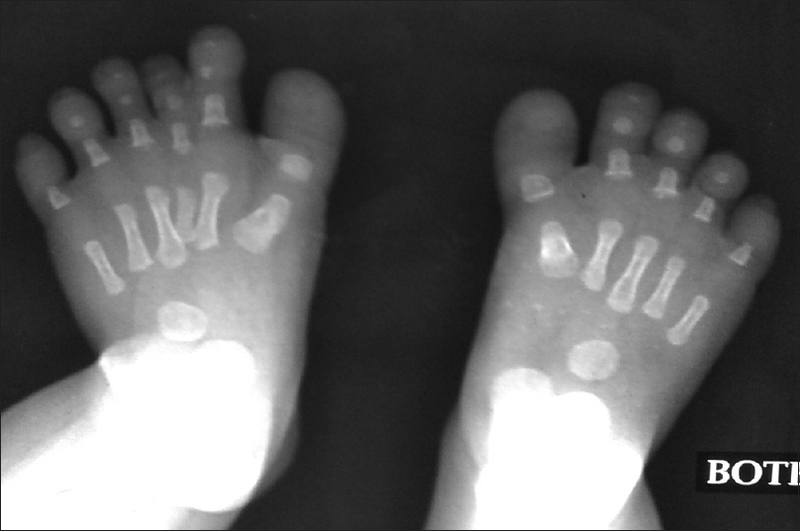 Polydactyly of the feet is an uncommon finding, observed only in 10% of cases of EVC. Furthermore, cleft of the mandible observed in the present case is an associated feature of WAD and not EVC. The presence of hypodontia and nail dysplasia is typical features of Witkop syndrome. 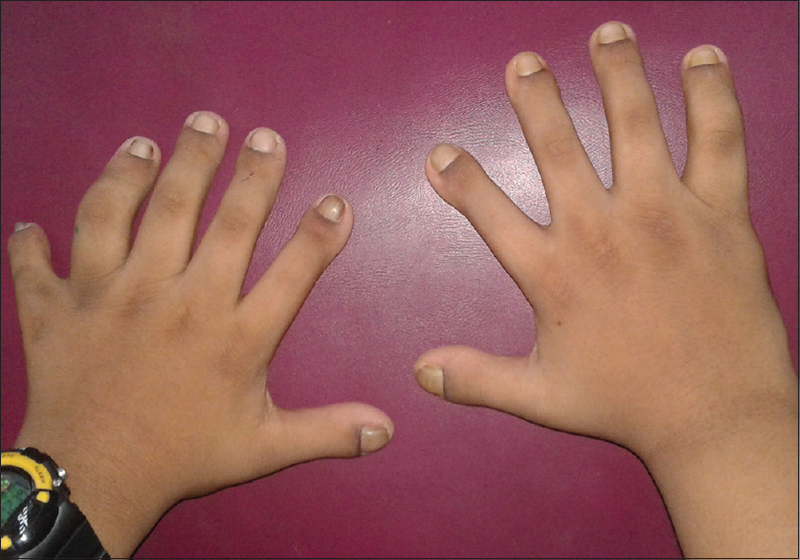 However, supernumerary digits are not associated with this rare dominantly inherited disorder. Orofacial digital syndromes are a heterogeneous group of genetic disorders characterized by the anomalies of the face, oral cavity, and polydactyly. The presence of nail defects in our case makes this diagnosis unlikely. Fried's tooth and nail syndrome also manifests dental anomalies and nail defects but is inherited in an autosomal recessive manner. Other ectodermal dysplasias with defects confined to the nails and teeth include deafness and onycho-osteodystrophy with retardation. WAD results from heterogeneous mutations in EVC2 gene located on the chromosome 4p16. EVC protein is known to help regulate a signaling pathway known as sonic hedgehog which controls cell growth, cell specialization, and patterning of many parts of the body. By interfering with sonic hedgehog signaling in the developing embryo, they probably disrupt the formation and growth of the teeth, nails, and bones., In the present case, no other family members had anomalies of nails, digits, and orofacial structures. Therefore, our case may be considered as an isolated case of WAD. Although the definitive diagnosis of WAD is achieved with genetic analysis, the condition is often diagnosed clinically supplemented with family history and radiographic examination. Management of WAD is generally a multidisciplinary involving general physician, plastic surgeon, dermatologist, and dental surgeon. Dental treatments include esthetic improvement and functional rehabilitation of supernumerary teeth and congenitally missing teeth. Early intervention of onychodystrophy and surgical correction of polydactyly are also recommended. WAD is a rare skeletal dysplasia characterized by oral and dental anomalies, onychodystrophy, polydactyly of the hands and feet, and mild short stature. Based on clinical and radiographic features our patient was diagnosed as having WAD. Early diagnosis and therapeutic intervention are of utmost important not only to rule out other pathologies but also to improve the quality of life. The authors certify that they have obtained all appropriate patient consent forms. In the form, the patient has given his consent for his images and other clinical information to be reported in the journal. The patients understand that their names and initials will not be published and due efforts will be made to conceal their identity, but anonymity cannot be guaranteed. It is most important not only to rule out other pathologies but also to improve quality of life. Weyers H. A correlated abnormality of the mandible and extremities (dysostosis acrofacialis). Fortschr Geb Rontgenstr 1952;77:562-7. Curry CJ, Hall BD. 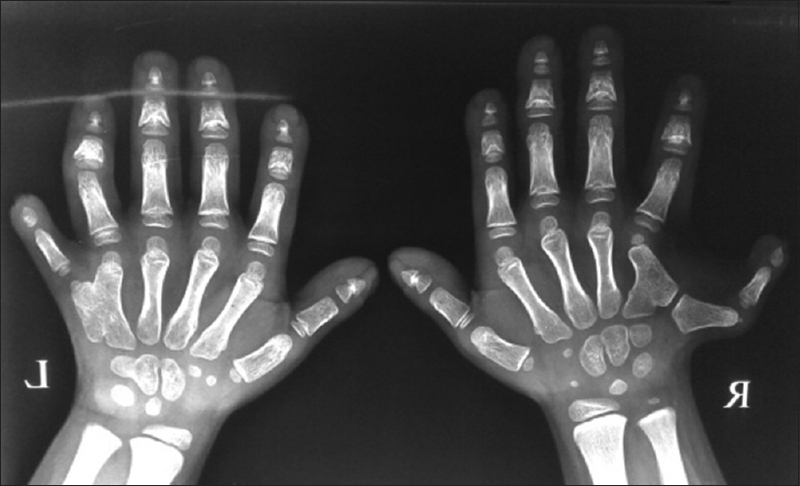 Polydactyly, conical teeth, nail dysplasia, and short limbs: A new autosomal dominant malformation syndrome. Birth Defects Orig Artic Ser 1979;15:253-63. Roubicek M, Spranger J. Weyers acrodental dysostosis in a family. Clin Genet 1984;26:587-90. Shapiro SD, Jorgenson RJ, Salinas CF. Brief clinical report: Curry-hall syndrome. Am J Med Genet 1984;17:579-83. Howard TD, Guttmacher AE, McKinnon W, Sharma M, McKusick VA, Jabs EW, et al. Autosomal dominant postaxial polydactyly, nail dystrophy, and dental abnormalities map to chromosome 4p16, in the region containing the Ellis-van creveld syndrome locus. Am J Hum Genet 1997;61:1405-12. Ellis RW, van Creveld S. A syndrome characterized by ectodermal dysplasia, polydactyly, chondro-dysplasia and congenital morbus cordis: Report of three cases. Arch Dis Child 1940;15:65-84. Ye X, Song G, Fan M, Shi L, Jabs EW, Huang S, et al. Anovel heterozygous deletion in the EVC2 gene causes weyers acrofacial dysostosis. Hum Genet 2006;119:199-205. Shetty DC, Singh HP, Kumar P, Verma C. Report of two siblings with overlapping features of Ellis-van creveld and weyers acrodental dysostosis. J Clin Imaging Sci 2012;2:18. McKusick VA. Ellis-van creveld syndrome and the Amish. Nat Genet 2000;24:203-4. Shetty P, Shetty D, Priyadarshana PS, Bhat S. A rare case report of Ellis van creveld syndrome in an Indian patient and literature review. J Oral Biol Craniofac Res 2015;5:98-101. Hudson CD, Witkop CJ. Autosomal dominant hypodontia with nail dysgenesis. Report of twenty-nine cases in six families. Oral Surg Oral Med Oral Pathol 1975;39:409-23. Nevin NC, Thomas PS, Calvert J, Reid MM. Deafness, onycho-osteodystrophy, mental retardation (DOOR) syndrome. Am J Med Genet 1982;13:325-32.